MANILA, Philippines – With more than 660,000 packs of macaroons already sold since the launch of Macaroons for a Cause, Philippine-based bakeshop Red Ribbon, Apl.de.Ap Foundation, and Franklin Baker Company of the Philippines are steadily reaching their goal to build their first public school through their collaboration. Macaroons for a Cause was launched July of this year to help bridge the education gap in the Philippines. The goal of the initiative is to provide more access to education in the country through selling 4.2 million packs of macaroons by building the first public school of the apl.de.ap Foundation. “We are happy that Filipinos also share the same vision in building a school to mold the Filipino youth and to enhance their skills,” says Zinnia Rivera, General Manager of Red Ribbon. 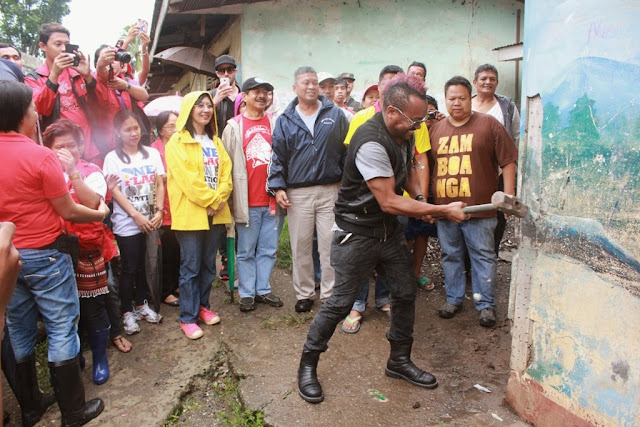 Apl.de.Ap took the first swing as they knocked down the current structure where the public school will rise. Red Ribbon, Apl.de.Ap Foundation and Franklin Baker Company of the Philippines recently announced that the public school will be built in Barangay Talon-Talon, where over 600 high school students will benefit in the area.